You are in college there are pressures and you want to do the best you can. You are taking a course and talk to friends, maybe they had the professor last semester or you do online searches and find the professors old course materials. You then use these materials to study. Then test day comes and you notice the test is identical or almost exactly the same as what you studied from. You end up getting a very high score, much higher than the class average. The professor then calls you in for a meeting and accuses you of cheating. 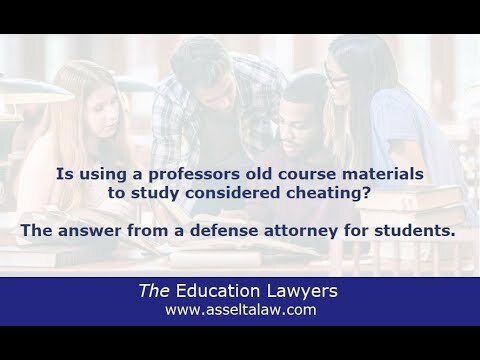 Is using a professors past course materials to study considered cheating? Maybe. It depends on your university. Does the university have a policy that using past materials against the rules, did the professor say anything in class or put anything in their syllabus that says this is not appropriate? There are many defenses to a cheating accusation and they depend on the facts of your case. Are you accused of cheating in school? Contact Asselta Law today. We offer free consultations and defend students throughout the United States. Richard Asselta is an award-winning defense attorney for students. He is experienced in helping students who are facing accusations of cheating in college.